I’m a member of Influenster which sends out boxes of free products for their members to try based on their answers to surveys. These boxes are called voxboxes and I received my first one back in July. 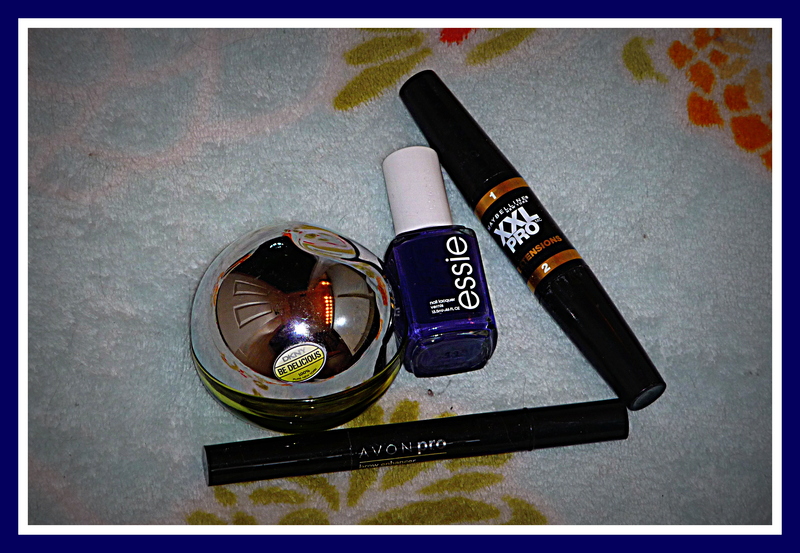 My first voxbox was full of beauty products, which you can see here, and I just received another beauty voxbox this month. Below is my review of all the products I received. I signed up for Influenster a couple months ago and sort of put it out of my mind until I got an e-mail letting me know I would get a VoxBox! For those who have never heard of Influenster (I only just recently heard about it from someone’s blog) let me fill you in. It is basically a website you sign-up for, answer simple questions about your likes and interests and you may be selected to receive a VoxBox. 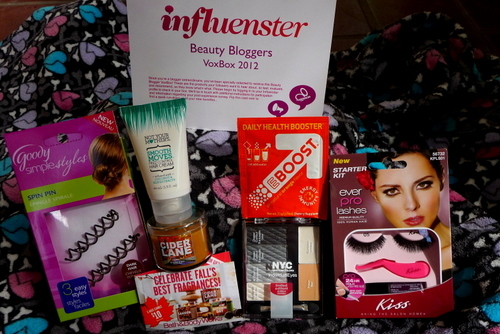 A VoxBox is a box of complimentary items sent to you in which you must test the products, review them, and spread the word. 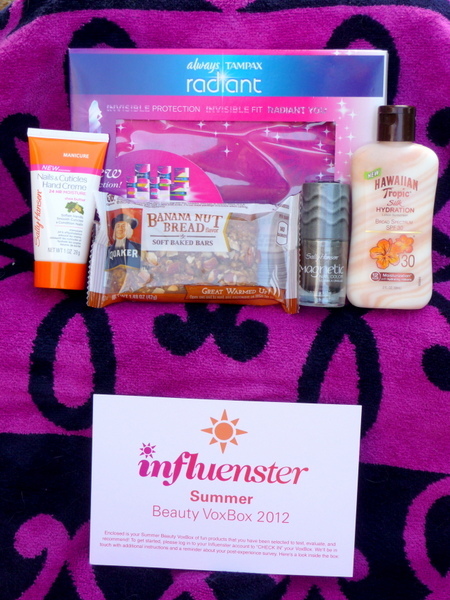 So here is what came in my Summer Beauty VoxBox and my thoughts on each item. There are many products that I love and I wanted to share just a few with everyone. They don’t sell this anymore, unfortunately, but it makes my hair smell so good. I’m pretty sure they still have this scent, but not in conditioner. This scrub smells so delicious and feels great on my face. I stocked up on these when they went on sale. This scent smells so delicious! I think I bought this last summer and shortly afterward they didn’t carry the scent anymore. It is now summer again so I’m hoping they will bring it back. I love how this conditioner makes my hair smell. They sell shampoo too, but since they are so expensive I just use the conditioner. I bought this when it was on sale and ended up really liking it. it has a refreshing smell that is nice when you don’t want something so perfumey. I have used intuition razors ever since they came out and love them. I LOVE this perfume and sadly my bottle is now empty. One time I was in an elevator and the guy next to me asked what my perfume was called because it smelt so good. I’ve never gotten a compliment on any other perfume before so I’d say it’s pretty good. I like all different types of nail polish, but this one goes on nicely and looks great. It still chips like most, but it lasts a little bit longer. I have only tried this color so far, but they have other great colors to choose from. I never used to wear brow liner or did anything to my eyebrows (other than pluck/wax them), but I tried this one day and loved it. It is a liquid that you brush through your eyebrows and makes them look great. The liquid actually looks like your real eyebrow hair, sounds weird, but it’s great. The only thing is it doesn’t last very long if you use it often. I have tried many different mascaras and so far this is my favorite. It is doubleended, one side is white and the other black. The white you put on first and it adds “extensions” to your lashes, and then you put the black over it. It makes my lashes look longer than any other mascara and never clumps. Most mascara I have used makes my lashes clump together which I hate and this works much better. These cookies are Target Brand and were sold there during Christmas time. When they went on sale afterward, my mom and I bought a bunch of these after we tried how amazing they were. Unfortunately they were a seasonal item, and will probably not be coming back, but at least we stocked up. They sort of remind me of a much better version of girl scout thin mints. I like baking sweets from scratch, but sometimes you don’t feel like doing all that work. 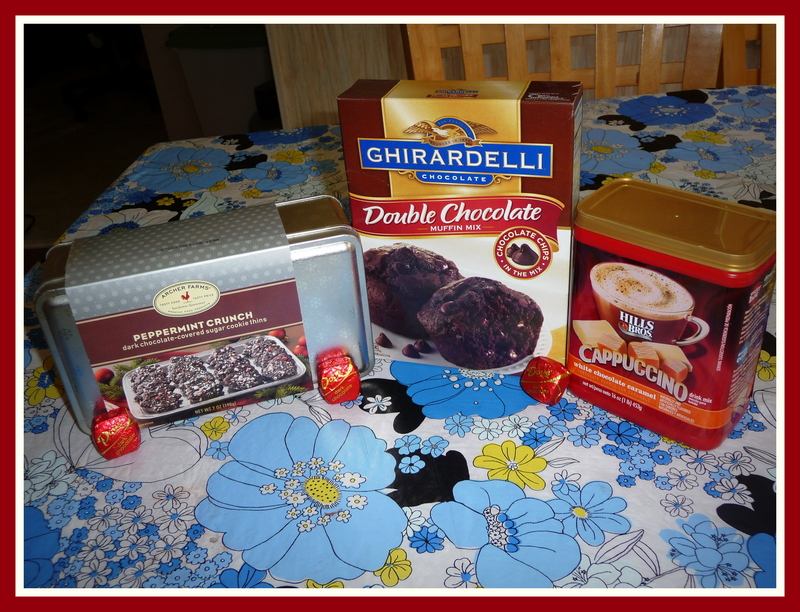 So when I’m in the mood for some delicious chocolate muffins, I always go to this Ghiradhelli box mix. I bought them at my local grocery store, but sometimes they are not always available. These really are pretty good though. I love coffee and bought this one day just to try it. It makes a decent instant cappuccino, but what I really like to do is add it to my coffee for extra flavor. Sometimes I just want a little dark chocolate and my go-to is Dove. I usually buy a bag of these to keep around in case I need a chocolate fix. I find that these taste much better than Hershey chocolate. 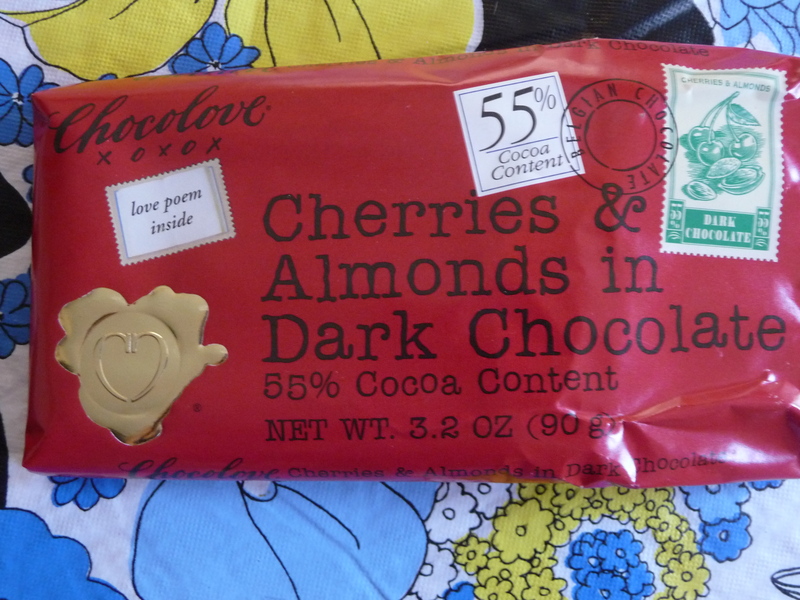 If you really want to try some amazing chocolate, go get yourself one of these Chocolove bars with dark chocolate, dried cherries and almonds. They used to carry these at Target, but now I have to venture over to Whole Foods or the Fresh Market if I want one now. They are pricey (I think it is $3 and change for one bar), but so worth it! They were recently on sale for $2.50. So delicious! What are your favorite products?